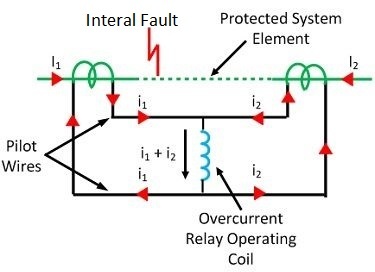 In the over-current relays, a current is sensed but such relays are not very sensitive as these relays cannot distinguish between heavy loads and minor fault conditions. in such castes. differential relays can be need. Thus a current differential relay operates on the result of comparison between the phase angle and magnitudes of the currents entering and leaving the system to be protected. Under normal conditions. the two currents are equal in phase and magnitude hence relay is inoperative. But under fault conditions. this condition no longer exist. The relay is connected in such a manner that the difference between current entering and current leaving flows through the operating coil.If this differential current exceeds a preset value then the relay operates and opens the circuit breaker. Almost any type of relay when connected in a certain way can be made to operate as a differential relay. 2. Biased beam relay or percentage differential relay. 3. Voltage balance differential relay. Most of the differential relays are at current differential type. Consider an over current relay connected in the circuit so as to operate as the current differential relay. This it shown in the figure. Two current transformers are used having same ratio are connected on the either side of the section to be protected.The secondaries of current transformers are connected in series, so they carry induced currents in the same direction. Let current I is flowing through the primary of current transformers towards the external fault. As the current transformers are identical, the secondaries of current transformers will carry equal currents. 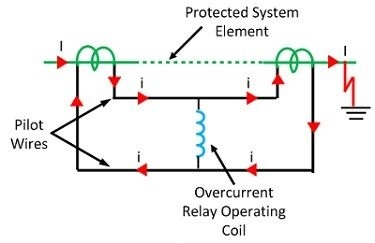 Due to the connection of relay, no current will flow through the operating coil for the relay, Hence relay will remain Inoperative. So relay cannot operate if there is an external fault. The current flows through the fault from both sides. The two secondary currents through C.Ts are not equal. The current flowing through the relay coil is now i1+i2. This high current causes the relay to operate. 1. The current transformers are connected through cables called pilot cables. The impedance of such pilot cables generally causes a slight difference between the currents at the ends of the section to be protected, A sensitive relay can operate to a very small difference in the two currents, though there is no fault existing. 2. The relay is likely to operate inaccurately with heavy through current flows.This is because the assumed identical current transformers may not have identical secondary currents due to the constructional errors and pilot cable impedance. 3. Under severe through fault conditions,. 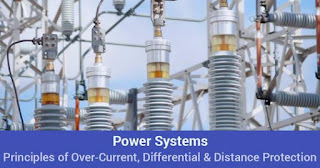 the current transformers may saturate and cause unequal secondary currents. The difference between the currents may approach the pick value to cause the inaccurate operation for the relay. 4. Under heavy current flows. pilot cable capacitance may cause inaccurate operation of the relay. All these disadvantages are overcome in biased beam relay.